Where some people see weeds, Naper Settlement’s Weed Ladies see possibilities for creativity! 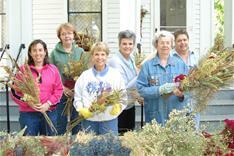 These volunteers design & sell floral arrangements and wreaths featuring dried & silk flowers as a fundraiser for the Naperville Heritage Society. Formed in 1969, a group of civic minded ladies were searching for a method to provide funds for the newly formed Naper Settlement. Floral arrangements in antique containers and “weed bouquets” made using dried flowers, grasses, and weeds were created and sold at an annual antique fair that helped raise funds for the Naperville Heritage Society. One of the husbands dubbed them the “Weed Ladies” as they frequently stopped and picked grasses and weeds along roadways. The name has stayed with them fifty years later! While remaining true to the style of the original group, today's Weed Ladies also design with silk flowers & succulents, creating designs following the current styles and trends. They maintain a memorial garden on the grounds, named after Kay Stephens, a passionate gardener and one of the founding Weed Ladies. This garden boasts several heirloom plants and others grown specifically for drying. The basement of the Daniels House serves as the drying spot where an array of colors and textures wait for the designers' use. The Daniels House at Naper Settlement is filled with a dazzling array of silk and dried floral arrangements. Peek into each nook and cranny, and you'll see designs that resemble works of art. This historic former physician's home receives its décor courtesy of a dedicated group of the Weed Ladies. The best part is, everything that you see is for sale! Please call 630-305-5289 to contact them or check on their hours. NN17 112114 Weed Ladies from Naperville News 17 on Vimeo. Purchasing a floral arrangement from the Weed Ladies benefits Naper Settlement's education and preservation programs.